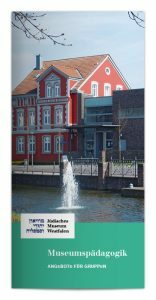 The Jewish Museum of Westphalia offers a wide range of guided tours of the exhibition which provide more insight into our exhibitions. We arrange tours and activities for a wide range of age groups, schools and interests. Below you will find an overview of the activities for children and young people that we have offered up to now. Visits can be designed to meet your wishes and can be combined. We welcome any ideas you may have and are happy to plan the visit together with you. On our website you will also find information on programmes for teachers and also teaching material. Below you will find information on our workshops, project days, films and other activities such as the rallies. Guided tours are also possible outside opening times. Groups of 20 people or more are divided up. We form two groups, one starting with a guided tour, then a break followed by the accompanying programme, the other group starting with the accompanying programme. If there are two groups we will charge another 30€ for the second guided tour. There will be no additional charges for the accompanying programme. Please make a telephone booking and reservation as early as possible. We will make every effort to plan your visit according to the needs of your group. Tours designed for children with songs and hands-on displays followed by a workshop: preparing food for Jewish holidays, writing Hebrew with the help of stencils, learning traditional games. Other subjects can also be arranged, e.g. Jewish holidays, Jewish calendar, kosher food. Visits can form part of the following subjects: social studies, politics, history and projects such as e.g., “One World”. “Racism”, “Cultures in Germany”. This is what we have already done together. Activities can be changed, adapted or combined; projects lasting several days or longer are also possible. HEIMATSUCHER is a project with people who witnessed the Nazi era. The Association interviews witnesses, documents and tells their stories. Apart from tradition and culture of Judaism, the tour of the permanent exhibition also focuses on the persecution of the Jews. This is followed by work in small groups which look at racist anti-Semitism, various stages of the extermination process and the issue of responsibility today. What does it have to do with me? Young people often ask this question when National Socialism and persecution of Jews are the subjects of lessons. By looking at social exclusion and resistance during the Nazi period, we hope to sensitise young people and look at social exclusion today. In group work, the students seek possible courses of action for situations in which someone is discriminated against. This study day can also take place at school. After a guided tour of the permanent exhibition, students look at the development of Jewish communities after 1945 and also at biographies of Jewish people from the region. Students can also see a film on Jewish life today. 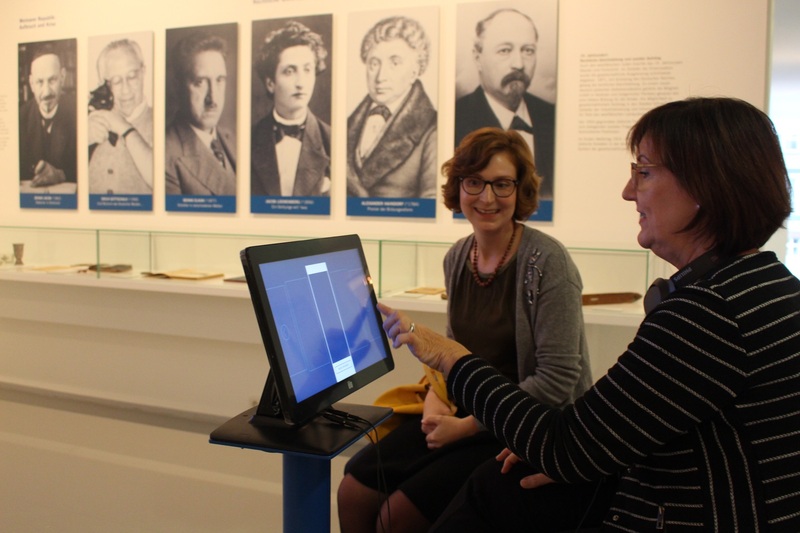 After a guided tour of the permanent exhibition students look at the biographies of Jewish personalities from Westphalia. The focus is on the emancipation and social advancement of Jews from the beginning/middle of the 19th century and the growing exclusion from the early 20th century which culminated in the Shoah. The tour of the permanent exhibition does not only focus on tradition and culture of Judaism but also the history of hostility towards Jews. The tour is followed by group work in which selected examples are used to illustrate the centuries of hostility towards Jews. The texts range from the Middle Ages to anti-Semitism in the German Empire to present-day anti-Zionism. After a short introductory tour, students actively explore the exhibition “Jewish Lives in Westphalia” (texts, audio stations). Small groups prepare their own texts, such as letters, diaries, reports and dialogues from the point of view of the people in the portraits and then present their results to the whole group. The tour of the exhibition on Jewish religion and culture focuses on exhibits and Jewish holidays also mentioned in the book. Students then work in small groups on different subjects: orthodoxy, shtetl, emigration, living conditions in the USA, maintaining and losing traditions. In the children’s TV programme “Willi will’s wissen” (Willi wants to know) the reporter Willi Weitzel provides information on a variety of subjects. In the programme on Judaism, Willi visits a synagogue, gets to know a Rabbi and the Thora. Then he learns something about the persecution of Jews by the Nazis. Willi also learns about Jewish dietary laws and holidays and goes to a Bar Mitzvah. In the children’s programme “Willi’s VIPs” Willi Weitzel meets famous people. In the programme on Anne Frank, he meets one of Anne’s old school friends, visits the Frank family’s hiding place and Anne’s old school. The short film has two timelines. It not only looks at the story of Anne Frank but there is also a link to the present day through Martin, a boy who is reading the Diary. Martin tries, for example, to make connections between the persecution of Jews and injustice today. Food is a central element of culture. People experience and show identities, emotions and homeland in and through their daily meals. Religion also influences what we eat. Almost all religions have more or less detailed dietary laws. What influence do these religious dietary rules have on people’s everyday lives today? The film accompanies a Jewish and a Moslem family in their kitchens. In the autobiographical film holocaust survivor Helmuth Noach talks about his life. He is the only member of his family to have survived the Holocaust. He speaks about fear, desperation and grief in the years of persecution. And the film shows him talking at schools. Marga Spiegel, her husband and daughter survived the Holocaust because they were hidden by farmers. The film, made by Petra Seeger. focuses on Marga Spiegel, who died in 2014 aged 101, and her saviour Anni Aschoff. They talk about two years of great danger, of many difficulties and of a happy ending for all involved. After a short guided tour, children have the opportunity to learn about Judaism in an easy and playful way. Hands-on activities, listening, puzzles help them to discover the museum. They fill in answers to questions on activity sheets which take them round the museum. The audio guide helps them to find the answers to lots of the questions. When does discrimination start? What forms of discrimination are there? What can I do if I experience discrimination? How do I show moral courage? Using dilemma situation, students discuss these and similar subjects. The project “A completely normal day” deals with anti-Jewish laws and orders under the National Socialist regime. It clearly shows the social exclusion that Jews suffered and the restrictions in their everyday lives. The students first write down their daily routines and the extent of social exclusion then becomes quite clear. “A completely normal day” was developed by the Anne Frank Zentrum Berlin. The aim of the project is to show the different situations of people living in Germany and to point out the various forms of inequality in everyday life. Everyone is given role cards and takes on a role/person. Questions are then asked and everyone answers playing the role of the person on their cards. The students in the room move because anyone who answers “yes” moves one step forward. “All people are equal” was developed by the Anne Frank Zentrum, Berlin.